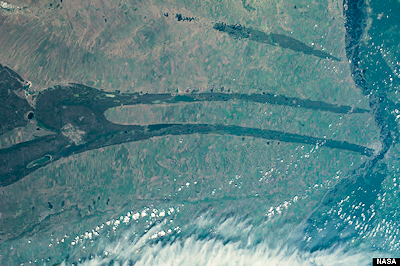 Astronauts looking down on Earth from the International Space Station in June were left scratching their heads when they spotted a “strange pattern of spikes" crossing Siberia's Kulunda Steppe. The astronauts were so puzzled that they called down to Houston to ask for an explanation, according to NASA. But only recently have scientists at the agency's Johnson Space Center been able to explain what the astronauts were looking at when they saw the dark green spikes stretching over the rural landscape. . . .